I have not met Aviva Polonsky nor Sebastian Gorka nor the people at Chat. Well, didn’t that just fire up a storm on social media. The usual suspects out there calling for her dismissal. 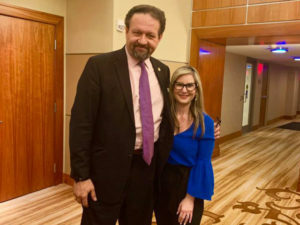 How dare she pose with Gorka? Isn’t he an anti-semite, a Nazi sympathizer? And the administration, Dr. Jonathan Levy, Head of School, without batting an eye, gave in to the bullies. Because that is what they are. And here is a school administrator kow-towing to bullies on social media when schools are supposed to be developing and teaching anti-bully protocols against students. What did the students at Tanenbaum CHAT learn? They learned that bullying works. On March 26, a group of alumni published an open letter addressed to Levy, expressing their concern and disappointment at the school allowing its students to meet with Gorka and calling for the school to launch an investigation. That was enough for this shtetl Jew (do I need the word alleged in here? ), Levy to duck and hide when the controversy arrived. What a lesson for the students. He is teaching them to be weak and afraid of controversy. Afraid to stand up with those who defend Israel. Jewish students are supposed to be taught the importance of asking questions. That is basic Talmud. Critical thinking is the outcome of such questioning. Did the administration question any of the allegations made by the social media bullies? “…in his remarks, Mr. Gorka was supportive of Israel and he encouraged students to stand up against anti-Semitism. I felt at the time that the message was a positive one for the students”. Seems that Sebastian Gorka has been labeled antisemitic and downright evil. How dare Ms. Polonsky encourage her students to listen to Sebastian Gorka at AIPAC? AIPAC; the Israel- America love fest? Was Gorka there as a mole for the Jew haters? Let’s say the allegations made against him are true. The Forward published evidence that “Gorka, President Trump’s top anti-terrorism adviser, had documented ties with fascist, anti-Semitic groups just a few years before he assumed a powerful and sensitive position in the White House. And these allegations were repeated in the CJN article, castigating Ms. Polonsky. Is he not allowed to change course? To repent ? Do tshuva? Is he to be attacked by gossip? Lashon ha ra forever? I don’t know about his past. I read about it. And pondered it. But I do know about his present. How you may ask? Because I listen to him and read about him. “In everything I have ever done, I have been a great friend of Israel”. He was also the keynote speaker at an Israeli Anti-Terror Conference! He was in Donald Trump’s administration standing with the first President in modern times to stand with Israel. Move the embassy to Jerusalem, the Capital City of Israel. The President who announced that the Golan is part of Israel. The President who stood with Israel at every moment in the UN. Perhaps we should let the students discuss this? This is the same Farber who bullied the Rabbi at Beth Tikva over providing a venue for Canadians for the Rule of Law, a group he finds offensive, to the point that the Rabbi took back his offer. Out of fear for his synagogue and congregation. I am breathless as well as gobsmacked. The irony of it all. Now that another letter has been sent by other alumni, castigating the administration for folding, appeasing, what will happen? The actions of TanenbaumCHAT in the wake of the incident regarding Sebastian Gorka and Mrs. Aviva Polonsky at AIPAC has deeply disturbed many of us alumni. We all remember CHAT being a school which was unwaveringly committed to Zionism and open inquiry. This is what makes CHAT such an excellent institution for Jewish learning, and many of us are concerned that CHAT is, in a moment of panic, faltering on this commitment. CHAT has nothing to apologize for, except for failing to stand up for one of their own teachers as she and her actions were viciously smeared by radicals such as Independent Jewish Voices. At the bare minimum, CHAT should be staunchly supportive of open inquiry and unapologetically Zionist. We strongly advise the school to defend their teachers, their institution, their students, and our birthright from vicious slander. We additionally urge the school to reject calls for investigation, denunciation, or discipline of Mrs. Polonsky and to make a commitment to respecting the rights of students to explore multiple viewpoints and engage in Zionist activity. What lesson will these Jewish students learn in the end? Will they become true People of the Book and question? Or will they slide into Politically Correct Group Think, promoted by the social media bullies?